We here at Great Grass would love to wish a Happy New Year to all of our customers, clients – and of course, to everyone reading! We’ve had an absolutely fantastic year, making 2015 one of the very best ever for our business and another incredible step on our way to providing the very best artificial grass in the UK no matter what. Our team definitely deserves some well-earned rest, as they’ve been working incredibly hard to ensure that our top quality artificial grass stays at the very forefront of the market. Not only that, but they’ve been on hand all year round ensuring installation, maintenance and repair services are never more than a phone call away! They’ve been constantly striving to ensure all of our customers have received nothing short of the best service possible, and the results should be all too clear to see when you get your hands on our incredible artificial grass. You can definitely take our word for it, but you’re more than welcome to head online and order your own free samples via the contact details on our website. We’ll get you the very best quality grass for you to experience first-hand, and it should be clear which commercial artificial grass product would make the ideal match for your garden or outdoor space. You can always give us a call, however, and we’ll be more than happy to discuss details with you. We’re wishing you the very best for 2016, so why not make sure that your garden is ready to handle the weather once winter’s in full swing? 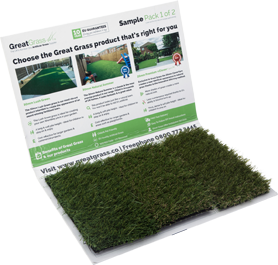 Here at Great Grass, providing top quality commercial artificial grass is definitely a speciality of ours. We’re just waiting to get you the very best artificial grass on the market, and our team is never more than a phone call or email away, so don’t hesitate to get in contact as soon as you can!